According to a Greek myth the place Tartarus is an abyss in the underworld - an ominous name for a cave but perhaps an appropriate one considering that Johan Meyers, who named it, was once a school teacher. In 1924 he retired to Kalk Bay to spend his days by the sea in the slow-paced beach town. Instead, he spent the next 26 years exploring the mountain that runs along the coast and discovering and naming a multitude of caves. 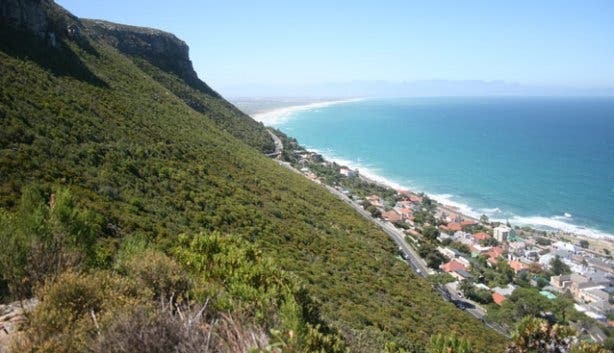 Apart being riddled with caves, the mountains above Muizenberg, St James and Kalk Bay have some lovely hikes through dense green vegetation that offer panoramic views of the sea below. There are two forest sections on the sea-facing side, one in Spes Bona Valley and the other, smaller one in Echo Valley. 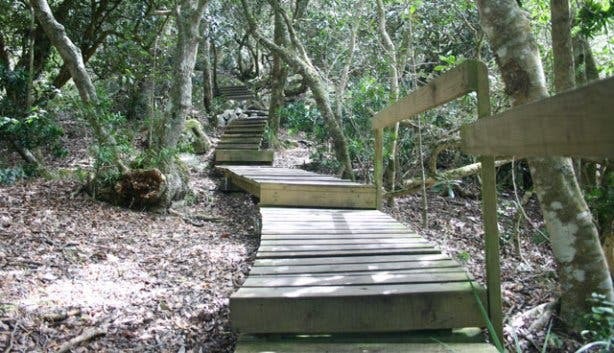 Both are made up mostly of milkwood and yellowwood trees, and wooden boardwalks have been set up to protect their ancient roots. There is often a cover of fast rushing clouds over this mountain range and today is no exception. On Boyes Drive the sun is out in full force though so we slather on the sunblock (and pack a jersey). Something warm. It can be freezing on top regardless of the tiny ant people you may see soaking up the sun on the beach below. Sun protection. Other than in the forest areas there isn’t shade as you’re walking. Hiking shoes. The terrain is rocky in parts so you’ll want a pair with proper grip. Water. Depending on which path you take you might need to bring water for the dogs too. Children. As long as they’re relatively used to hiking the route to the Spes Bona forest should be fine for them to handle. The promise of an enchanted forest should keep the whining to a minimum. Snacks or sarmies. There are some truly beautiful spots to enjoy a rest, our flask of tea went down a treat under the yellowwood trees. The CPSS. If you want to explore the caves then contact the Cape Peninsula Speleological Society (see below for details). Dogs. You will need aMy Activity Permit. If you are hiking on Cave Peak then you will need to keep them on a leash as there are many dangerous caves in the area. 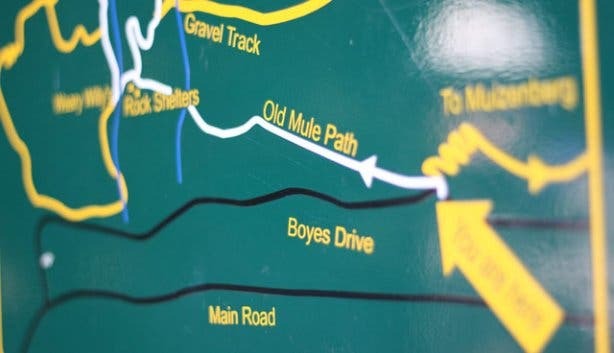 There are various route you can take up the mountain which start on Boyes Drive where there are allocated parking spaces across from the signposted starting points. If you’re driving towards Kalk Bay side keep an eye out for the Ou Kraal sign on the right just before you pass St James beach below, this will take you along Old Mule path which is a gentle contour that meets up with Ou Kraal. 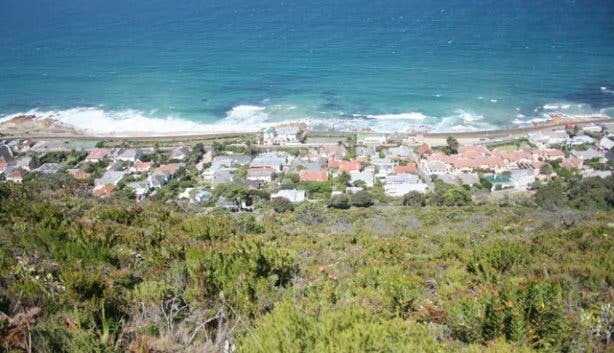 You can also park further on just above Kalk Bay which is a steeper route directly up the Ou Kraal path. You can take a relatively short hike up to the Spes Bona forest or make a day of it and continue along into Silvermine East. Park opposite the Ou Kraal sign on Boyes Drive, follow the path along the contour of the mountain. You’ll pass the shark spotter diligently watching the waves. 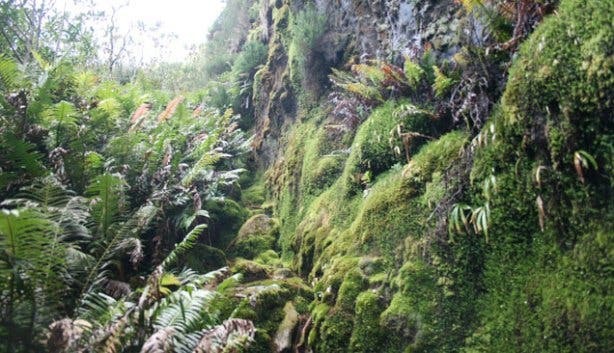 Old Mule Path is an easy contour path that slowly climbs along the mountainside with fantastic views of the sea below. This links up to Ou Kraal path which then climbs up the Spes Bona Valley. The path is easy to follow and is well signposted where the path splits. Follow it up until you reach the Spes Bona forest, from here there are raised wooden boardwalks through this shady area. 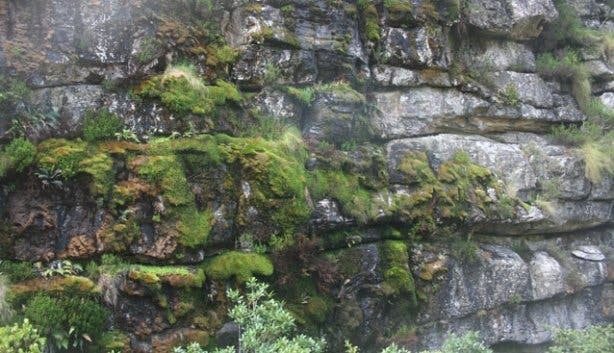 Keep an eye out on your right as you get to the top of the forest for a moss covered cliff which drips water in summer and turns to a waterfall in winter. You can follow the path up and around to the Amphitheatre, or the other way through Mimetes Valley and then back along the Hilltop Path or follow the original route back. Duration: This will take about three and a half hours depending on which paths you take. 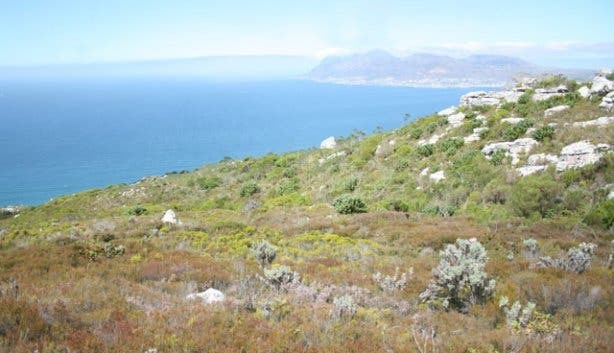 Park above Kalk Bay and follow the Echo Valley sign leading to the Ou Kraal path, or for an easier walk take Old Mule path and then follow the signs to the amphitheatre. This route takes you up through Echo Valley and the ambitiously named ‘Amazon Forest’ to the natural amphitheatre. You can go around and come down through the Spes Bona Valley or go back down the way you came. Duration: This will take about four hours depending on the route you take. Take the route to the Amphitheatre and take the path to the left at Cavern Rocks also known as Hungry Harry’s (a clump of boulders on the right). 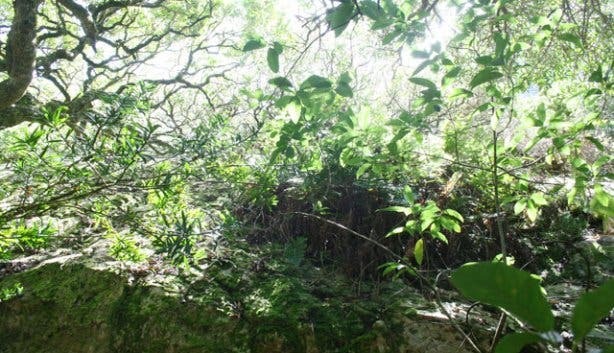 Follow the path up past Boomslang Cave and several others. Don’t explore the caves on your own and keep your dogs on a leash in this area. You can follow the path around and come down through the forest in Echo Valley or continue on and come down through the Spes Bona forest. Fauna: From mid-August to mid-October keep an eye out for the Southern Right Whales. Old Mule Path is a great place to do this from. 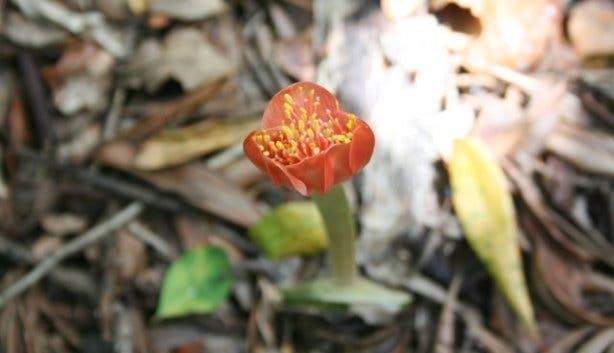 Flora: We spotted plenty of flowers, most notably the April Fool or, as they’re called in Afrikaans, the velskoenblaar (haemanthus sanguineus ) which was blooming in the Spes Bona forest. Between August and December be on the lookout for the Erica urna-viridis which can only be found in this particular area. 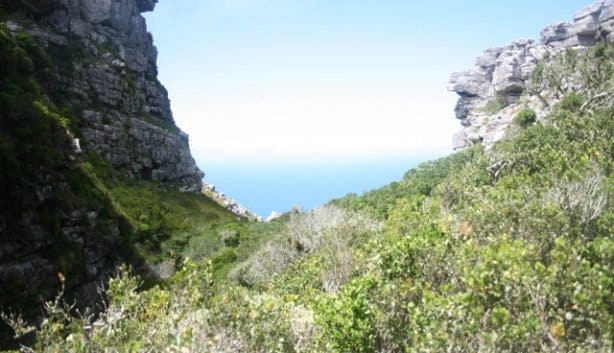 The Cape Peninsula Speleological Society (CPSS) have monthly cave explorations on the first Sunday of every month that are open to the public (you need to contact them beforehand so they can arrange extra gear). You can attend the first meeting for free to see if you are interested, if you are, then the annual fee is R250 per person per year with special rates for students and families. Have a look at our Facebook album of the Spes Bona Forest hike and follow us on Twitter to find out where we’ll be hiking next. Plus, subscribe to our weekly newsletter for a seven day weather forecast.